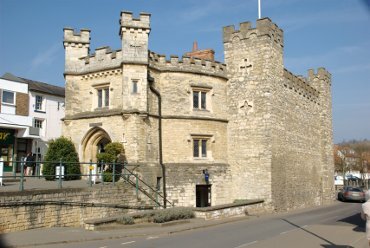 The Old Gaol, built in 1748 in the style of a castle, has now been converted to a museum and also house the Tourist Information Centre. Buckingham is a nice old town with some interesting narrow streets. The town centre was destroyed by a fire in 1725 and, consequently, most of the remaining buildings are Georgian. 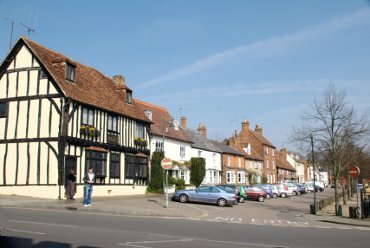 Part of High Street showing a timber-framed building which is probably 17th century in origin. This is just behind the Old Gaol in the picture above. High Street consists of two parts; the one you see here and another one parallel to it, out of the right of the picture, with the two sections seperated by an 'island'. The entrance to the main car park is just off to the right. The River Great Ouse rises in Northampton and passes through Buckingham on its way to Kings Lynn, near The Wash, where it discharges into the sea after a journey of 150 miles. 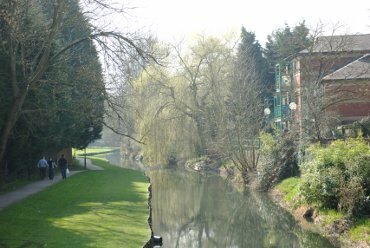 There is a riverside walk, seen here, along part of its length in Buckingham. The Church of St. Peter and St. Paul is not particularly old having been completed in 1781. 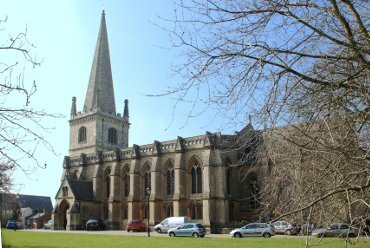 It is, however, an impressive church both outside and inside with a rather ornate interior. Run by the National Trust this garden covers 750 acres and includes over 40 monuments and 4 lakes. 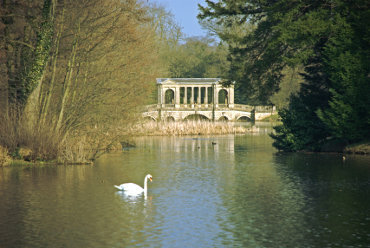 This view along the Octagon lake shows the Palladian Bridge.